government of Nicolas Maduro as international support grew for his bid to oust the embattled president.The move heightened fears for the security of the 35-year-old National Assembly leader, who declared himself acting president last week in a bold challenge to Maduro’s authority. The police’s special action force, FAES, had gone to his home to interview his wife Fabiana Rosales, Guaido said during a speech at Caracas university.”At this moment the dictatorship believes that it will intimidate us,” Guaido said, his wife at his side. Earlier, European lawmakers recognized Guaido as the acting head of state — another step forward in his bid to force out the socialist leader who has presided over the oil-rich country’s economic collapse.Several opposition leaders have been jailed in recent years as Maduro cracked down on growing dissent in the Latin American country, where resistance has escalated with Guaido’s spectacular self-proclamation. The dramatic turn against Maduro’s leftist regime culminated quickly, but it came after weeks of behind-the-scenes diplomacy including a hushed meeting in Washington with Guaido, who was quickly recognized by Washington as Venezuela’s president. Henrique Capriles, 46, a former presidential candidate and an opposition leader in recent years, said the opposition was unaware Guaido would declare himself the country’s leader on January 23.”That surprised a lot of political figures (but) I don’t say that as a criticism,” Capriles said. marshaling international support, Guaido is seeking to maintain street pressure against Maduro, and has called more mass protests for Saturday. Thursday, lawmakers at the Brussels-based European Parliament voted to accept Guaido as “legitimate interim president of the country” — and urged the European Union to follow suit.Four major European powers — Britain, France, Germany and Spain — have said they would do so if Maduro fails to call presidential elections by the weekend. US on Thursday urged all European countries to recognize Guaido, but Maduro has told the “imperialists” to wait until 2025 for new elections. Guaido was at the main Caracas university to present his “rescue plan” for a country in economic meltdown.”We are going to address the humanitarian emergency, stop inflation in its tracks, reactivate the oil industry and move towards the restoration of access to public goods and services,” he said to cheers.Part of the plan unveiled by the opposition leader and his economic advisor Jose Guerra is to end exchange controls in force since 2003 and renegotiate Venezuela’s estimated $150 billion debt. 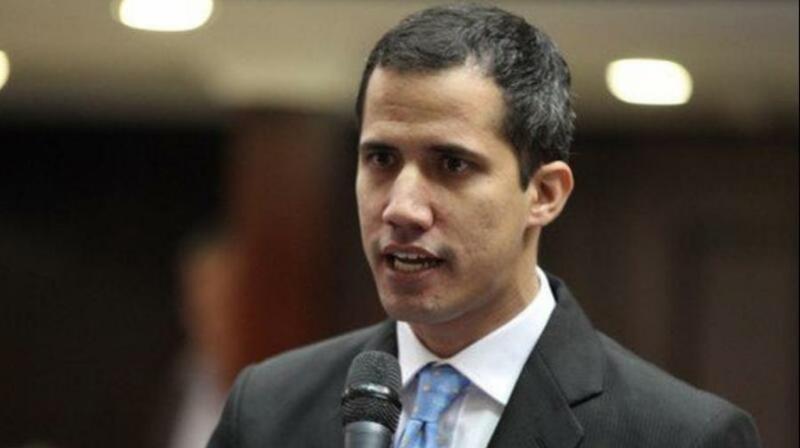 With his wife at his side on the podium, Guaido said he had a 20-month old daughter at home and would be holding FAES accountable for “whatever they do to my baby.”He told officials: “Do not cross the red line.”But the National Police tweeted it is “totally false” that there had been any search of Guaido’s family. The United States, which immediately recognized Guaido’s self-proclamation, along with a dozen Latin American countries, Canada and Australia, has warned Maduro of “serious consequences” if he targets opponents. On Thursday workers from Venezuela’s state oil company PDVSA — hit by new US sanctions this week — held an “anti-imperialist” march in support of Maduro. “Yankee go home,” said one of their signs. A day earlier, thousands led by Guaido protested in various cities, banging pots, blowing whistles and horns, and carrying banners that read: “Armed forces, regain your dignity” and “Maduro usurper.”Guaido wrote in a New York Times op-ed published on Wednesday that “clandestine meetings” had been held with members of the armed forces and security forces, who he is trying to woo with an amnesty offer. But Guaido’s moves to court the military are fraught with risk. Last week fewer than 30 soldiers rose up against Maduro, precipitating protests that, according to the United Nations, ended with more than 40 dead and hundreds detained.So far, the military high command has remained loyal to Maduro. US National Security Advisor John Bolton on Thursday said Maduro should accept Guaido’s amnesty officer.